The hero of the 1992 Cricket World Cup win, founder of SKCHRC, founder of Namal University, Chancellor of Bradford University, the most popular leader of Pakistan, a symbol of Change for the people of Pakistan and Chairman Pakistan Tehreek-e-Insaf Mr. Imran Khan was discussing some important matters pertaining to the future of Pakistan. Me: Assalam O Alikum Khan Sahib, Thanks a lot for giving us time. What’s your message for the youth and people of Pakistan on the occassion of the upcoming historic Jalsa in Sialkot (23rd March 2012). IK: The Jalsa in Sialkot is an important part of our tsunami ….. Ask yourself is he not the best of all politicians? Is he not the best amongst them all for Pakistan? If yes, and indeed he is, than come join hands for a positive change on 23rd March 2012 (Friday) to write a new chapter in the history of Pakistan. Throughout the world history and across the globe, wherever two-party system got strong they always got together to stop the way for a third force. PTI has done a good job but would need to be very careful for both the pro-status co parties would now set aside their differences atleast re certain matters to counter Pakistan Tehreek-e-Insaf (PTI). This was what a very respected and learned personality told me just after the infamous Lahore Jalsa and it has been proven to be true to every single word. Zardari’s infamous quip in his inner circles often quoted by insiders that Mian sahib is his insurance who would ensure that his government does not fall (due to his greed for another term & his personal grudges against Pervez Musharraf). This has also been tragically proven true. Unfortunately due to personal vendetta, greed for another term and fear of PTI, Mian brothers of PMLN have joined hands to support the most corrupt Govt in the history of Pakistan. They were not bothered that people are finding it hard to live and Pakistan is going down by every passing day. All they want is their turn and revenge from Musharraf even at the cost of Pakistan. The two major pro-status quo parties of Pakistan, i.e. 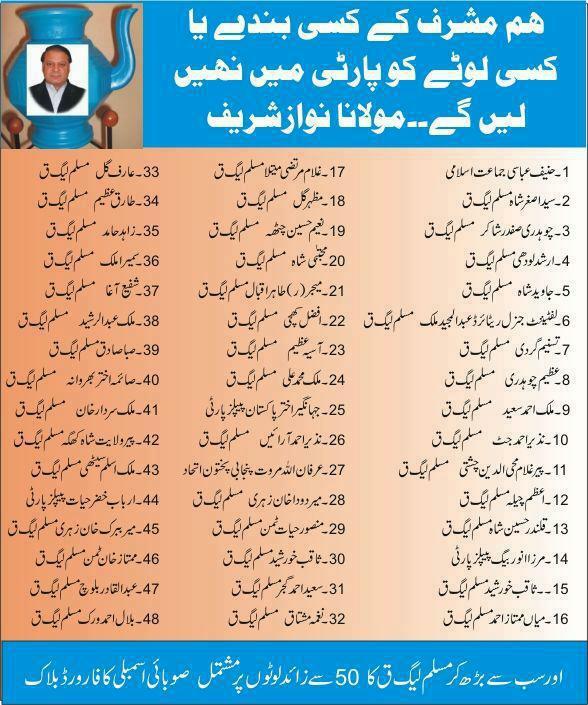 PPP & PMLN have taken nepotism, incompetence, corruption and dynastic politics to unprecedented levels. On one hand after Bhutto, it’s his wife, than sons, than daughter than Zardari’s turn into Bhutto and now Bilawal and sisters are in the waiting. On the other hands, after Mr. Nawaz Sharif, it’s Shahbaz Sharif, than Hamza & than Maryam Sharif. Are we a slave nation destined to be ruled by the Bhuttos, Sharifs & Choudhary? Aren’t there anyone else competent in a nation of more than 180 Million people? No we are not slaves and PTI will break this vicious cycle. Even the change of faces in this rotten system is a welcome change but PTI is working for a change of system. More than 8,500 Billion Rupees of KNOWN corruption had been highlighted by Transparency International during the tenure of the current “Demo(n)cratic’ Government. This translates to just under a $ 95 Billion which is much more than the entire foreign debt on Pakistan since Independence. This corrupt government is backed by their natural allies in PMLN at the cost of plundering the resources of Punjab through corruption in Sasti Roti, Danish Schools, Laptop scams and land grabbing in Aashiana. The indirect plundering by modifying the policies to benefit the Sharif’s business is a long story which warrants another detailed post. Lack of electricity, gas, employment, law & order, peace & tranquility and economic opportunities is driving the country to the brink and people are forced to commit suicides, sell their children or sell themselves to foreign funded militias. Since we all know about the incompetence & corruption of PPP but PMLN’s media managers portray it as efficient it is important to briefly analyze it’s performance. Post 18th amendment a lot of powers have been devolved to the provinces and as such the blame and responsibility for high inflation, joblessness, severe law & order problems, health system breakdown, chaos in education systems and financial bankruptcy in Punjab lay with the PMLN’s Punjab Govt which incidentally is supported by the biggest block of “lotas” in Punjab Assembly in recent history. The refusal to allow Health Ministry to take preventive steps before outbreak of dengue and the fake medicine fiasco resulted in the deaths of hundreds of innocent citizens. This is while the crime rate has sky rocketed and the provincial Govt has not even planned for a single energy project of it’s own. Now that’s what they call “Bad Governance, Good Media Management”. The people who joined PTI actually left positions of power to join an opposition party. What’s more iconic is that Mian Nawaz Sharif himself left Tehreek e Istaqlal so what would that make him, I wonder? In anycase both Bhutto & Mian Sahib started their political careers in the lap of dictators, Ayub Khan and Zia Ul Haq respectively. On the other hand Mr. Imran Khan started his political struggle on his own and turned down the lucrative offers by not only Mian sahib but Mr. Musharraf too. So it’s more of a matter of the pot calling the kettle black. Another famous propaganda line of the pro-status quo parties has been that “Establishment (read ISI) is supporting PTI and since the Head of ISI Mr. Shuja Pasha is retiring, the joinings of heavyweights have stopped”. Nothing can be far from truth. It’s actually iconic being propagated by PMLN stalwarts who are now being exposed to have been born. Bred & fed by Establishment. From the support of Mr. Zia Ul Haq to Mehran Bank scandal it is there for all to see. Post the success of the historic Lahore & Karachi Jalsas and the rhetoric of PMLN that Zaradari Govt staying in power anymore would be killing for Pakistan, many politicians due to various reasons flocked to PTI. Some of them were pretty good too but that’s another topic. Coming back to the point, Zardari & Co got the point across to Mian brothers that let us make a deal and eat our share of the cake otherwise we both will be drowned by the tsunami of PTI led by Imran Khan. This led to them joining hands in 20th Amendment, for Senate’s so-called “elections” where votes were bought and sold openly and the Memo-case where Mr. Nawaz Sharif went back after initially vowing hard to take the “culprits (read Zardari & Co)” to task. Not only did it ensure another year or so of the “killing for Pakistan” rule by Mr. Zardari but also ensure that the next Chief Election Commissioner & Caretake Setup would be appointed by “agreement” of PMLN & PPP, thereby ensuring that there “interests” would be protected and another “jharlu” can happen. Now with the prospect of elections atleast a year away with conspiracies of delaying the elections till General Kiyani & CJ Iftikhar Choudhary get retired by the by PPP & their partners in crime PMLN have made the traditional politicians take a halt to “enjoy” the Govt positions, favors and/or funds while it last and leave the decision of joining another party for later. Personally I believe this can actually be a blessing in disguise for PTI with some proper steps taken. What PPP & PMLN are not realizing is that PTI & the youth of Pakistan are prepared to thwart such attempts and if the revolution is stopped democratically than a bloody one is writing on the wall. PTI has enough street power to shut down all major cities but that is the last option. Remember the Tahrir Square of Pakistan would be much worse as even the armed forces would have to be neutral. Therefore it’s better if the pro-status quo parties stop cooking up these despicable schemes. People are not fool anymore and you cannot buy all the media at the same time. Just the other day I was hearing about 2 Million, yes 2,000,000 laborers who are now unemployed due to the policies of this PPP/PMLN Government & partnership. What would they do? How would they feed their families? How long before they lose the hope and turn on those who have oppressed & looted them? People on the streets have made up their minds and no amount of propaganda can disillusion them except for PTI infighting. So let us join hands and work together. I work for the cause of Pakistan, wider Muslim Millat and Humanity as Pakistan’s situation affects not only the entire region by the entire globe. What about you? A poem I wrote in 2009 which is still very relevant today. You sent an sms to 8300 with your CNIC (Computerized National Identity Card) Number but found that you are not registered. Or maybe you are registered in a different area than yours. What to do now?. You want to register your vote or rectify it. It is not that difficult actually. Fill form 4 ( download from http://www.ecp.gov.pk/DC/Form-4.pdf ) and take it to your local ECP centre (list can be found at the ECP (Election Commission of Pakistan) website http://www.ecp.gov.pk ). Forward this to all your friends so they can play their part in a positive change for a better future of Pakistan, wider Muslim Millat and thereby the wider humanity.